We originally proposed this special section of the Journal of Interactive Technology and Pedagogy because of the continued disconnect regarding knowledge and understanding of Africa and the rapid changes across sub-Saharan Africa with regard to digital technology. In discussions of digital change in Africa at professional conferences and presentations, we have been questioned repeatedly if pressing issues such as water and sanitation should be examined first instead of encouraging Western scholars to promote research on digital technology and the continent. According to some recent studies, by 2015 sub-Saharan Africa will have more persons with access to mobile phone networks compared to electricity access at home (Ali 2011; Buskens and Webb 2009, 71), so we find this sort of interrogation to be astonishingly naïve. However, only a few sectors, including healthcare, banking, and agriculture, can as yet demonstrate a correlation between emerging digital technologies and macroeconomic impact (Bowman, Mensah, and Urama 2014, 45). 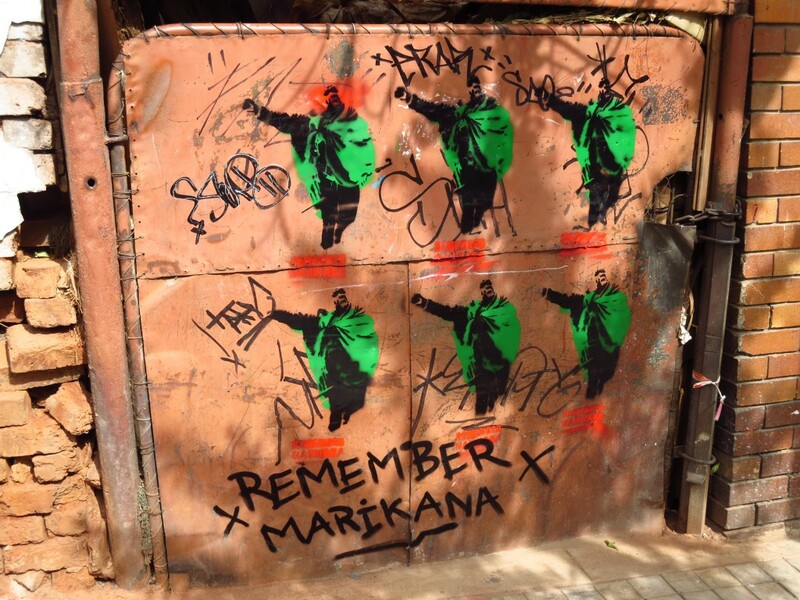 “Remember Marikana,” Maboneng, Johannesburg, South Africa (Nieves 2014). Similarly, we would argue that by re-inscribing a more global digital humanities (O’Donnell 2012) we might begin to see the value in turning our attention to the geopolitical borders of the African continent. For example, Kenyan blogger, cyber-activist, and lawyer Ory Okolloh started the website Mzalendo to monitor that country’s once highly secretive parliament. Okolloh also helped to create Ushahidi, a crowd sourcing, web/mobile-based utility enabling citizen journalists and eyewitnesses all over the world to report violence and human rights atrocities through crisis mapping (Okolloh 2009, 65). Ushahidi is just one example of the many innovations transforming our understanding of digital advocacy projects that make space for critical voices in countries across Africa. Similarly, historian Keith Breckenridge’s Biometric State: the Global Politics of Identification and Surveillance in South Africa, 1850 to the Present (2014) examines South Africa’s role in promoting transnational biometric measurement and technological experimentation. In light of the technology transfer and information networks that originated in South Africa during the nineteenth-century (as outlined by Breckenridge), a very different present-day understanding of the “digital divide” is suggested. Too often a sole focus on the “digital divide” fails to demonstrate how digital technologies are being used to advance humanistic inquiry into the dynamic work ongoing by individuals and communities either in Africa or across the African diaspora (Fuchs and Horak 2008, 100). By redirecting our focus beyond the established canons of where and how innovation takes place (and by whom), what may now be explored is a much more complicated constellation of important work that may have been previously overlooked, silenced, or diminished. Michele Pickover, Curator of Manuscripts of the University of the Witwatersrand’s Historical Papers, has raised important questions as to what is prioritized and, ultimately, digitized in African archives and how a “monolithic nostalgic legacy” is assigned greater value. Rather, the question that should be posed is who has agency to recover narratives of the past? The constant re-editing, depending on who controls the current nationalist discourse, also suggests different paths for historical legacy or historiography (Pickover 2014, 7). How do we trace the genealogy of this work? No one starting point or single path is indicated. Instead it will be a constellation of paths that will trace the radical and sometimes diverse transformations with regards to education, society, economy, and political liberation and self-determination in Africa over the last 50 years. One interesting aspect of ICTs includes the trajectories of digital projects beyond corporate banking and communications to include archives and data curating, independent film and video, art-making and music production, pedagogical practices, and community-based digital activism. The individual use of ICTs that re-mix their intended use include public participation graphical information systems (GIS), cell-phone delivered prenatal education, and feminist projects that address the stubborn gender digital divide. The ways that such practices use ICTs to facilitate their own empowerment bring attention to the ways that gender impacts ICT development and demonstrate how ICTs are impacted by such use and are in fact gendered (Antonio and Tuffley 2014). Over the past decade, scholars have witnessed rapid changes in both legacy-industrial and emerging technology infrastructures across the African continent (Wilson and Wong 2006, 30, 120, 147). The tired and long-held post-colonial narratives of disease, war, and famine across Africa are now being re-written in the face of rapid redevelopment. This process goes hand-in-hand with multinational corporations’ continued desire to tap into the emerging markets there. Remarkably, Internet educational technologies coupled with the staggering number of mobile phone subscriptions—including innovations such as feature-rich smartphones, dual-SIM card phones, and cash flow back to the continent through e-remittances—have had a significant impact on all levels of African society. Some have argued that an ICT revolution is already taking hold in countries such as Kenya and South Africa, where the international community has made political and economic investments in reform and infrastructure (Kelly and Rosotto 2012, 107). The growing influence of Asian investment across eastern Africa—particularly Chinese investment—should not be categorized simply as an opening-up of new market investments in natural resource extraction. Rather, we would argue that while ICTs might have an enormous positive impact on rural and urban populations, it might also usher in a kind of second or third wave of colonial rule over emerging knowledge systems—a rule that may be naively perceived as benign global transnationalism by many Western outsiders (Buskens and Webb 2009, 77). Significantly, according to the latest published figures 84.9 percent of the population in North America uses the Internet versus 21.3 percent penetration in Africa (MMG 2014), so further overseas investment—and influence—may be taken as a given. African states, international non-governmental organizations (NGOs), and some indigenous community-based organizations are working collaboratively to push for universal access to the Internet and the quickly growing cell phone market in southern and eastern Africa. Many of these changes have been made possible, because in the 1990s and early 2000s transnational organizations such as the International Telecommunications Union (ITU), the United Nations (UN), and the World Bank advocated for new policies and practices to expand ICT development across Africa. The growing African telecommunications market encouraged reforms that helped to bolster ICT infrastructure. Notable infrastructure developments across the African continent include the SAT-3/WASC or South Atlantic 3/West Africa Submarine Cable; SEACOM connecting most of Eastern Africa through a submarine cable operator; EASSy (East African Submarine Cable System); and the National ICT Broadband Backbone. This infrastructure has been accompanied by a corresponding digital migration process freeing up broadband/bandwidth space, resulting in a reduction of prices throughout the region (Koutroumpis 2009, 471). Our interest in these issues is not to perpetuate Western scholarly preoccupations with the “digital divide”—something that clearly persists in Africa. Instead, we are proposing that a kind of flattening out of this divide in southern and eastern Africa now exists and is worthy of further investigation. As such, Africa should no longer be viewed through a monolithic continent-wide paternalistic lens—a lens that is unable to focus on country-specific research and analysis involving digital technologies. Specifically, African-based institutions including NGOs, universities, and entrepreneurs are increasingly leading efforts to solve African problems by assuming greater control over heritage and development issues using information technologies. Development studies and recent scholarship in ICTs in Africa have highlighted the importance of new digital technologies as tools for furthering social justice while at the same time underlining pervasive educational, economic, and political inequalities in their application (Bablola 2014). How are ICTs and digital tools being used, challenged, implemented, and incorporated in grassroots and institutional development in Africa and in the Diaspora? As guest co-editors of this special section of JITP, we hope this effort can be the start of more critical engagements with issues of race, gender, power, imperialism, and neoliberalization that help to expand conversations across scholarly communities, especially those communities in the digital humanities that remain exclusively white, homogenous, or largely centralized in the West. Changes in the field here in the United States are rapidly taking place because of the work of scholars such as Lisa Nakamura, Alondra Nelson, Tara McPherson, Mary Corbin Sies, and Siobhan Senier (to name but a very few) — scholars who actively disrupt mainstream trends in the digital humanities and digital studies by providing new sources for archive-making, publication, and preservation through feminist and intersectional analysis. These inter-, multi-, and transdisciplinary frameworks and forms of analysis give us important models to use in other contexts and knowledge communities outside the US. Most recently the collaborative work of scholars and activists in #DHPoco including Adeline Koh, Roopika Risam, and Dorothy Kim (http://dhpoco.org/); and FemTechNet (http://femtechnet.org) have brought attention to a host of these and other complex issues. In November 2014 ICT University in Yaounde, Cameroon, was the site for the sixth annual ICTs for Africa (ICT4Africa) International Conference. This year alone three major research universities in the Global North are coordinating workshops and lecture series including Princeton University’s “Black Studies in the Digital Age”; York University’s “African Diaspora 2.0: Oral Sources and Digital Humanities”; and the University of Michigan’s “African Studies in the Digital Age.” The University of Michigan’s week-long workshop, in collaboration with the University of the Witwatersrand, is the second installment of a program funded by the Andrew W. Mellon Foundation entitled “Joining Theory and Empiricism in the Remaking of the African Humanities: A Transcontinental Collaboration,” a five-year interdisciplinary research and teaching partnership between the African Studies Center at Michigan and the Institute for Social and Economic Research at WITS. Similarly, several important volumes have also appeared, including Digitizing Race: Visual Cultures of the Internet (Nakamura 2007); Digital Diaspora: A Race for Cyberspace (Everett 2009); Digital Griots: African American Rhetoric in a Multimedia Age (Banks 2010); and African Studies in the Digital Age: DisConnects? (Barringer and Wallace 2014). Few of these works focus entirely on the many digitization projects, digital platforms, and community-engaged partnerships that have emerged over the past two decades on the African continent. Unfortunately, a focus only on completed works fails to look critically at the many realities facing so many of these digital projects, particularly financial and human resources in both the Global North and South. Proposed projects or proof-of-concepts are also significant interventions because they help to raise awareness of issues impacting national libraries, local historical societies, and diasporic communities across the Global South. The Ulwazi Programme (http://www.ulwazi.org/) collects and shares local knowledge and histories in the form of a wiki enabling contributions and modifications from multiple users in English and isiZulu. Map Kibera (http://mapkibera.org/about/) was launched in 2009 as a project dedicated to help create essential maps for the residents of the city’s slums in Nairobi, Kenya. Map Kibera also deploys other on-line tools including software for information collection, visualization, and interactivity provided by Ushahidi (http://www.ushahidi.com/). Annie Bunting of York University (http://tubman.info.yorku.ca/research/diaspora2/abstracts/) and her multidisciplinary team of scholars and community organizers work with victims of forced marriages in post-conflict societies, including Sierra Leone and Rwanda, to gather new video testimony of these crimes. Jaksch and Nieves began work on the Virtual Freedom Trail Project in 2010 with the intention of creating an open-source, community archive and web-based virtual, living museum centering on the marginalized voices and experiences in the struggle for liberation in Tanzania (see, http://www.virtualfreedomtrailproject.org/). The Soweto Historical GIS Project (SHGIS) seeks to build a multi-layered historical geographic information system database and geospatially accurate 3D environment that explores the social, economic, and political dimensions of urban development under South African apartheid regimes (1904-1994) in Johannesburg’s all-black township of Soweto. The Mobile Alliance for Maternal Action (MAMA) (http://askmama.mobi/) is a global movement that seeks to use mobile technologies to improve the health and lives of mothers in developing nations. We hope the work in this special section will lead to further investigation and a robust integration of Africa-related work into the emerging canon of scholarship. Ali, Laila. 2011. “The digital revolution in sub-saharan Africa.” Al Jazeera Online, 12 October. http://www.aljazeera.com/indepth/features/2011/10/201110108635691462.html. Antonio, Amy, and David Tuffley. 2014. “The Gender Digital Divide in Developing Countries.” Future Internet 6 (4). http://www.mdpi.com/1999-5903/6/4/673/htm. Banks, Adam J. 2010. Digital Griots: African American Rhetoric in a Multimedia Age. Carbondale, Ill.: Southern Illinois University Press. OCLC 633139665. Bowman, Warigia, Marianne Mensah, and Kevin Urama. 2014. “Information and telecommunication technologies in Africa: a potential Revolution.” Innovation for Sustainable Development. Edited by Jean-Yves Grosclaude, Rajendra K. Pachauri, and Laurence Tubiana. New Delhi: TERI. OCLC 883178928. Breckenridge, Keith. 2014. Biometric State: the Global Politics of Identification and Surveillance in South Africa, 1850 to the Present. New York: Cambridge University Press. OCLC 881387739. Buskens, Ineke and Anne Webb. 2009. African Women and ICTs: Investigating technology, gender and empowerment. London: Zed Books. OCLC 321068837. Everett, Anna. 2009. Digital Diaspora: A Race for Cyberspace. Albany: SUNY. OCLC 833290225. Fuchs, Christian, and Eva Horak. 2008. “Africa and the digital divide.” Telematics and Informatics 25. OCLC 4662516406. Kelly, Tim, and Carlo Maria Rosotto, eds. 2012. Broadband Strategies Handbook. Washington, DC: World Bank Publications. OCLC 784885717. Koh, Adeline, and Roopika Risam. Postcolonial Digital Humanities: Global explorations of race, class, gender, sexuality and disability within cultures of technology. http://dhpoco.org/. Koh, Adeline. 2014. “Niceness, Building, and Opening the Genealogy of the Digital Humanities: Beyond the Social Contract of Humanities Computing,” differences: A Journal of Feminist Cultural Studies 25 (1). OCLC 5582686267. Koutroumpis, Pantelis. 2009. “The Economic Impact of Broadband on Growth: A Simultaneous Approach.” Telecommunications Policy 33 (9). OCLC 450806382. LCHP (Lakeland Community Heritage Project). 2014. Lakeland Community Heritage Project: Preserving the history of African Americans in College Park, Maryland. http://lakelandchp.com/. Mansell, Robin, and Uta Wehn de Montalvo. 1998. Knowledge societies: Information technology for sustainable development. Oxford: Oxford University Press. OCLC 473804582. MMG (Miniwatts Marketing Group). 2014. “World Internet Users and Statistics and 2014 World Population Stats.” http://www.internetworldstats.com/stats.htm. Nakamura, Lisa. 2007. Digitizing Race: Visual Cultures of the Internet. Minneapolis: University of Minnesota Press. http://www.SLQ.eblib.com.au/patron/FullRecord.aspx?p=334221. OCLC 781375257. Okolloh, Ory. 2009. “Ushahidi, or ‘testimony’: Web 2.0 tools for crowd sourcing crisis information.” Participatory Learning and Action 59 (1). Pickover, Michele. 2014. “Patrimony, Power and Politics: Selecting, Constructing and Preserving Digital Heritage Content in South Africa and Africa.” Paper presented at International Federation of Library Associations and Institutions (IFLA) World Library and Information Congress (WLIC), Libraries, Citizens, Societies: Confluence for Knowledge, Lyon, France, 16-22 August. http://library.ifla.org/1023/1/138-pickover-en.pdf. Senier, Siobhan. 2014. Writing of Indigenous New England: a review blog by Siobhan Senier. http://ssenier.indigenousnewengland.com/. Vectors: Journal of Culture and Technology in a Dynamic Vernacular. http://www.vectorsjournal.org/. Wilson, Ernest J. and Kelvin R. Wong. 2006. Negotiating the Net in Africa: The Politics of Internet Diffusion. Ann Arbor: Lynne Rienner Publishers. OCLC 226255963. Siobhan Senier’s (University of New Hampshire) work with indigenous communities in New England is a significant model for collaboration with long marginalized and silenced voices, http://ssenier.indigenousnewengland.com/; Mary Corbin Sies (University of Maryland) has been working to recast the relationship between African American communities that border many American universities and campuses across the United States, http://lakelandchp.com/ (LCHP 2014); Tara McPherson (University of Southern California) has developed an online journal and publishing platform that have both radically changed digital publishing in the American academy, http://www.vectorsjournal.org/ (Vectors). Dr. Marla Jaksch is Associate Professor of Women’s and Gender Studies and affiliate faculty of African American Studies at the College of New Jersey. In 2009-2010 Jaksch was awarded a Fulbright Fellowship at the Institute of Development Studies at the University of Dar es Salaam in Tanzania where she conducted research and taught . Her current teaching and research interests include the gendered and racialized dimensions of ICTs and STEM and their implications for women and girls. Dr. Angel David Nieves is Associate Professor of Africana Studies and Director of the American Studies Program at Hamilton College, Clinton, N.Y. He received his interdisciplinary Ph.D. in the History of Urban Development and Africana Studies from Cornell University. Nieves is currently Co-Directing Hamilton College’s Digital Humanities Initiative (DHi), a $1.75 million Mellon Foundation Grant funded project (http://www.dhinitiative.org). Nieves’ scholarly work and community-based activism engages critically with issues of race and the built environment in cities across the Global South.